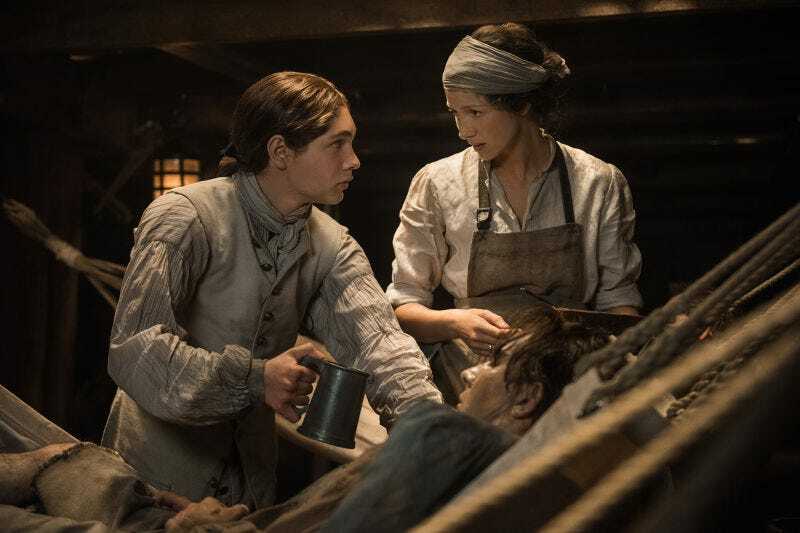 This week, Claire makes the best of being a captive doctor on a ship full of diseased sailors, while Jamie becomes a captive Scot on a ship full of people who care about Claire less than him. After Claire sails away from Jamie, realizing she doesn’t have much choice and facing 100 sick men, she gets to work. With the aid of her trusty pal Elias, and the weight of the captain behind her, she sets about cleaning up the ship, hydrating the sick, and instilling sanitization protocols using alcohol made from the rations of grog originally intended for the sailors to drink. Jamie, on the other hand, thinks he has a choice on whether or not to pursue Claire; the captain of the Artemis disabuses him of that notion rather quickly and locks him up for good measure. I really liked Jamie’s scenes with Fergus - it’s the first time I’ve really felt how much Jamie still loves Claire. I am proud of Fergus too, though - standing up to Jamie and pointing out the futility of his plan to mutiny, and later defending his choice on account of Marsali. To protect her, Fergus will move Heaven, Earth, and Jamie Fraser’s will. While Jamie stews and pukes and looks at Brianna’s photos in his cell, Claire pokes around and gets some more information that turns out to be pretty useful. Harry Tompkins, one of the crew, was actually the same man that Ian confronted in the printshop the night of the fire. He can attest to both the seditious pamphlets in the printshop, plus the mysterious corpse stuffed into a smuggled cask of creme de menthe, all attributed to A. Malcolm a.k.a. James Fraser, last seen on the Artemis. Once the Porpoise arrives in Jamaica, they plan on using Claire to capture Jamie and convict him of at least one hanging offense. Well that won’t do, so Claire and Annika, the woman in charge of the ship’s goats (guess it’s not a curse when she stays with the livestock eh? ), try to get Claire away when the ship makes land. Unfortunately, the good Captain Leonard finds her trying to flee (and reveals he knows that she knows) and takes her back to the ship. So Annika comes up with a brilliant backup plan - for Claire to jump off the ship in the night as they sail away and float back to shore before Captain Leonard notices. So, to the swell of the Craigh na Dun theme, Claire takes a leap of faith. Jamie won’t be far behind, freed thanks to Marsali convincing the captain that he will need Jamie’s help to navigate around the islands. Jamie comes to his senses too, agreeing not to rebel and giving Fergus and Marsali his blessing for their marriage. Next week, Claire makes landfall, the Artemis runs into some trouble, and we will still be waiting for our heroes to reunite, looks like. Another 18th century man doesn’t like Claire....surprise, surprise...sigh. Elias’ death scene beautifully echoed the scene from season 1 during the boar hunt when Claire comforts another dying man. They left out a critical character from the Porpoise, which, really it worked without that character but I would have liked to see their scene together. It’s a moment where Claire vents about watching so many men die, which would have added a nice dimension to her experience. Seriously, there are only 3 episodes left in the season? ?